Put your hand down corn nugget... we gots some answers. What is a Mama Bear? Mama Bear: a creature that is all cute and cuddly… until you mess with her kids. Then $#!% just got real. Apolo... what? What are you apologizing for? What is Mama Bear Apologetics? Mama Bear Apologetics is predominantly an audio formatted ministry for moms with busy schedules. Many moms – especially those with young children – don’t have the luxury to just sit and read (unless you count those few precious moments in the bathroom before little fingers start clawing their way under the door in desperation to show you their latest conquest – like how big a spit bubble they can make.) Because of this, we want Mama Bear to provide resources and equipping in a way that fits your life and your schedule. For those who are visual learners or want a quick overview, we have the blogs and articles and podcast summaries and resources. For those who love to multitask and prefer audio format, (i.e. those whose only “free time” is while they commute, fold laundry, sit at soccer practice or make dinner) we have the podcasts. Basically we want to do whatever we can to equip you as a mom without making you feel like you have to add one. more. thing. to your crazy schedule. Just bring us along on your way to pick up your daughter from ballet practice, or while you’re at the grocery store. Our biggest goal for the future is to have a Mama Bear App which will make searching and listening to podcasts more efficient than a mobile website. Please pray for God to provide the resources for us to do so. Why study apologetics? Shouldn't we just have faith? My husband and I have had people say to us, “Well if you knew everything, then why would you need faith?” This is itself a faulty view of faith. Hebrews says that faith is “being sure of what you hope for, and certain of what you do not see.” So I ask you: Doesn’t anything that makes you more sure and more certain increase your faith? It sure does! What is the youth exodus? The Youth Exodus Project is a joint project of several ministries – including Mama Bear, Ratio Christi and Probe Ministries. Our goal is to understand and communicate the research regarding why youth are leaving the church in record numbers upon graduation from high school. While some do return, many do not. As a church we need to be aware of the trend, and we need to listen to those who left so that we can begin to understand why so many young people feel that church is not the place for them anymore. If we don’t seek to understand the trend, we’ll never be able to reverse the trend. For a great summary on the Youth Exodus research and proposed solutions, see Ryan Huxley’s outline. Hillary and Rebekah would be happy to come present at your women’s group as a team, or Hillary is comfortable speaking on her own. Hillary’s favorite topics are The Youth Exodus, the role of science in apologetics, challenges to the Darwinian model, the problem of evil, and understanding and diagnosing doubt. She is available to travel during the week, but prefers the weekend so that she doesn’t have to take too much time off work. And she needs notice, so that it doesn’t fall at the same time as graduate finals. Rebekah prefers to limit her speaking engagements to co-presenting with Hillary. She is still a bit shy by herself. 🙂 She too prefers to travel on the weekends when her husband can be home with their two daughters, though with enough advanced notice, she could make arrangements. I'm a beginner to apologetics. Where do I start? Good for you! Learning apologetics is not the easiest thing in the world, but it is fun! If you are a little nervous about jumping into some book that expects you to understand how quantum epistemic realities relate to the metaphysical world, relax… We’ve got some great intro material to recommend! 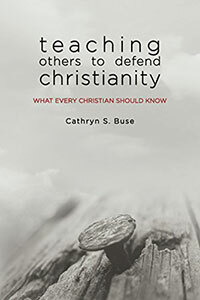 Teaching Others to Defend Christianity was written by our own Mama Bear Cathryn Buse! In fact, after reading an interview by Sean McDowell regarding this book, I bought it immediately. After reading about halfway through, I knew Cathryn was destined to be a Mama Bear. If you would like a super condensed, and uber-systematic, cliff-notes summary of the major apologetics questions, this is the book for you. It is designed to be used as a 6-week small group study, and takes you all the way from “Is there a God?” to “If so, is it the Christian God?” all the way to why we should accept Jesus as the one who was sent from God. As a former NASA engineer, Cathryn weaves together a very well-ordered picture on why we can trust God, the Bible, and Jesus. One of the best parts is, the Kindle version is only $2.99! But I still recommend the hard copy so you can mark it up. Our good friend Natasha Crain’s second book is out!! This is a great place to start for a general overview of apologetics questions relating to God. I gave this book to every one of my sisters and cousins for Christmas. 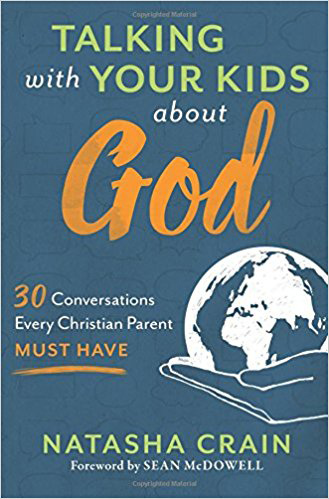 The best part about it is the conversation guides at the end of each chapter which take you step-by-step how to talk with your kids about these important issues. You can find print versions here, and Kindle versions here. Cold Case Christianity is also one of the best and easiest reads out there. 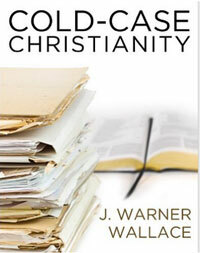 J. Warner Wallace is a 30-year veteran cold case detective and former atheist who decided to put his skills as a detective to use and “prove” Christianity false. In the process, he began to realize that the evidence for the Christian faith was actually convincing, and became a Christian himself. He does an incredible job of explaining how detectives evaluate evidence and then takes you the reader through the evidence for the resurrection and reliability of New Testament documents. I cannot recommend it enough. You can find it in print here, kindle version here, and audible version here and audio CD set here. Mere Christianity is still in my Top 5 favorite apologetics books of all time. I first went through it in a high school Bible class, and it was love at first page. C.S. Lewis is inarguably one of the greatest minds of the last century. He is also the author of the acclaimed children’s Narnia series – perfect for reading with your children before bed. Mere Christianity takes you on Lewis’ journey from atheism to Christianity, exploring the logic that brought him to his knees when he recognized that all his arguments against the Christian God didn’t make sense once he dug a little deeper. 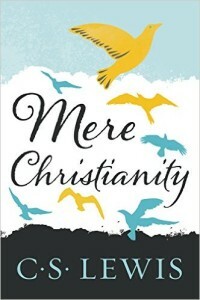 Mere Christianity is available in print new or used, kindle, and online audio or as a CD boxed set. 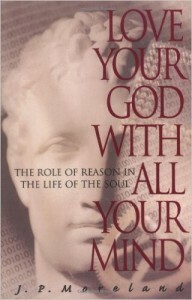 Love Your God With All Your Mind is also one of my favorite intro books. So often we are reminded that we are to love the Lord with all our heart, but we forget about that whole mind aspect. In this book, J.P. Moreland gives an inspiring and empowering case for what it means to love God with all our minds, and exactly why it is important to do so. This book is available new and used, on kindle, and in audio format as well as mp3 CD’s.